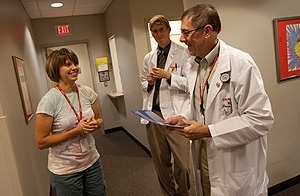 UW Health Eau Claire Family Medicine has a unique partnership with Chippewa Valley Technical College to serve as its Student Health Service. Students at Chippewa Valley Technical College (CVTC) in west-central Wisconsin have easy access to outstanding, affordable primary care, thanks to a long-standing partnership in which UW Health Eau Claire Family Medicine serves as the CVTC Student Health Service. Launched in 2004, the CVTC Student Health Service was the first of its kind at a Wisconsin technical college. Student health services are commonly found at four-year universities, but not at two-year technical and community colleges. Any student carrying at least six credits during the spring and fall semester, or three credits during the summer, can use the service. That’s about 4,100 eligible students during the academic year, and about 800 during the summer. For $36 per term, students receive access to primary care delivered by a physician-led care team. To keep out-of-pocket costs low, most services performed in the clinic are covered. For example, a student who has an acute illness requiring an office visit and in-house labs would have no additional out-of-pocket costs. The Eau Claire clinic is located at CVTC’s Health Education Center, and across the street from CVTC’s Business Education Center, making it extremely convenient for the college’s students and staff. That means health students can easily obtain physicals or vaccinations before a community practicum. Others may have a complete physical before graduation, while they are still eligible for the service. Dr. Keys added that the close proximity also benefits staff, who appreciate having medical care nearby for their students—and who may use the clinic themselves. Students who visit the clinic are also encouraged to sign up for online electronic health records, and some continue as patients after graduation. The Student Health Service is just one of several ways the Eau Claire clinic and CVTC work together. The Eau Claire clinic also serves as an internship site and information resource for CVTC health programs, and both entities share radiography and laboratory equipment that would not be affordable individually. CVTC students and Eau Claire residents also benefit from state-of-the-art simulation training at CVTC’s Human Patient Simulator laboratory, for which Dr. Breen is the medical director. “The CTVC Human Patient Simulator laboratory is a team effort that provides an amazing learning experience for residents and CVTC health students,” Dr. Breen noted.